South of France - Sun, Sea, and Seafood! The coastline of the Herault is abundant with fantastic restaurants and quirky spots to sample the gastronomic delights of the region. Especially if you are a seafood lover! 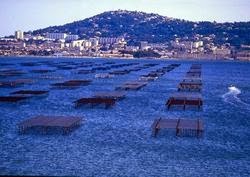 The Etang de Thau has to be the epitome of oyster growing in the south of France, it is the largest and deepest of the lagoons in the Languedoc and has the widest variety of marine life. The nearby villages of Bouzigues and Marseillan have the wonderful charm of ancient fishing ports and beautiful marinas lined by restaurants and cafes. There could not be a more idyllic place to enjoy a platter of oysters and bottle of Picpoul de Pinet – the local classic combination. The freshest oysters that are grown on the beds that stretch out into the Etang and the classic crisp, zesty and fresh wine grown in the vineyards surrounding the villages and mad only a few miles down the road….what could be more perfect? If you are looking for a Fruit de Mer feast then look no further than La Ferme Marine. A local favourite located in a rather unassuming plot right on the Etang and just 5 minutes out of Marseillan. When visiting in the day time you will get a spectacular panoramic view of the the Etang and and across the water the town Sète and the Mont St-Clair hill just above it. The restaurants atmosphere is busy and convivial, so leave your airs and graces at the door and be ready to get stuck into a seafood fest of oyster slurping, prawn peeling and crab claw cracking. The all you can eat buffet has a plethora of seafood all waiting to be sampled, including oysters fresh out of the Etang, half crabs and crab claws, cockles, mussels and juicy pink prawns. The greedy among us will rejoice to know that the buffet is “à volonté” meaning you can eat as much as you like! The restaurant also serves a variety of hot and cold à la carte dishes, a spectacular favourite of these is the Parillada which is a platter piled high with a variety of grilled fish, king prawns and scallops. If you are looking for a holiday filled with gastronomic delights then a family holiday booked with South France Villas may just be exactly what you are looking for!